For some reason, German chocolate cake doesn't really excite me. I love both coconut and chocolate, so what's my deal? I wish I knew. One of our Thanksgiving desserts was an upside-down German chocolate cake, expertly-made by my dear grandma. 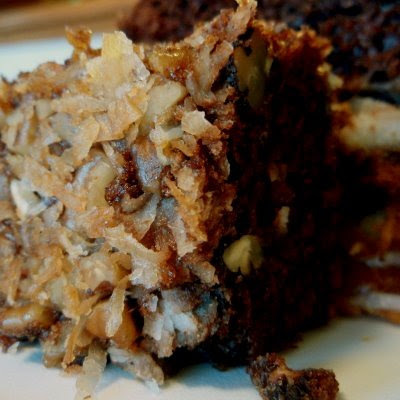 This is not to be confused with the inside-out German chocolate cake, which is different (but no less decadent), with multiple layers of coconut-pecan filling and a chocolate ganache. 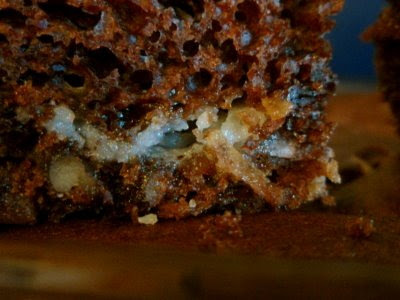 This upside-down version is simply and magically composed of pecans and coconut on the bottom of a frosting-less chocolate cake, speckled with blobs of cream cheese goodness (see below). It was a big hit with my family (after all, you saw that behemoth box of chocolates we attacked). You and yours might like it, too. Me? I'm sticking with apple pie. Preheat oven to 350 degrees. Grease and flour a 9x13-inch pan. Scatter the coconut and pecans around the bottom of the pan. Prepare the cake mix according to directions on box and pour the batter over the nuts and coconut. Mix cream cheese, butter, and powdered sugar until well-blended and drop by spoonfuls onto the top of the cake. Bake for 45 minutes or until a tester comes out clean. Usually when cakes look this amazing, the recipe is as long as book. The fact that yours is five sentences has made this go straight to my "make as soon as a chocolate craving hits" folder. Thanks!! Mmm - chuck in pecans and cream cheese, and you can bet I'll eat it. Oddly enough, apple pie is on my bottom rung of pies, but mmm - give me a crispy apple tart and now we're talking! It does look decandent! I'm with you though, give me apple pie! All apologies but this would win over apple pie...maybe I'm scarred from the American Pie movie? Can I have apple pie and this dessert? :) It looks super good! I actually had to scroll down and up again, coz I was sure I missed out part of your recipe :P I love how short and simple it is! I don't ever use cake mix but I would certainly eat it if it were at my Thanksgiving table. My mom makes this and it is soooo delicious. Thanks for the reminder, haven't had it in a while! My hubby loves German chocolate cake and this one looks so good and very simple to make!! Thanks Gramma .. this appeals to me, cause I do not like frosting .. LOL! How could you not LOVE this? My very favorite cake in the world is German chocolate. I could eat the whole cake by myself. Excellent photo - now I am craving cake. Well, it's usually the frosting that gets me all delicioused up when it comes to German chocolate cake. However, this looks too fantastic to pass up! I think your problem with German chocolate cake may be that it's too sweet. I need a little "less sweet" on top of my sweet (or vice versa) in order to just love it! Well, it's pretty, but I'm still going to attack that big ol' box of chocolates when I find it! Looks tempting! I love pecans but where's the cinnamon? Mmm, it's sinful. Looks so good. Now, here's a twist: I'm not a huge fan of chocolate, but I really like german chocolate cake. This looks great! Oh my goodness, sticking with an apple pie over a GRANDMA made German chocolate cake? Grandma made recipes are the best. It sounds like you had a great time. Ok, I love me some apple pie but this cake? I could eat the whole thing, I am sure of it. awwww, I really really miss being able to enjoy my grandma's cooking... that looks delicious! Your title reminds me of that Katy Perry song, "You're in and you're out, you're up and you're down..."
Sorry, I obviously listen to too much top 40 radio. I'm adding this recipe to my repertoire ASAP, as I've never met a German Chocolate Cake I didn't love! Please tell your grandma I said, "Thank you!" I think we have the same taste in desserts. I'd stick with the apple pie too. Inside out? Upside down? Wow, you've really got a cool recipe collection there! I think it looks and sound perfect just the way it is. Grace I've been tempted to make a german chocolate cake but nobody here likes coconut but me, I 'll have some of that apple pie though. And I happen to like your photos of the culinary goodness that is your blog! Well it looks good to me, save me a seat next to grandma. This looks great, I love german chocolate cake. This recipe takes chocolate cake to a whole new level!!! Wow, my mouth is watering now! OMG, "multiple layers" of fabulousness. Ooooh my word, that looks awesome!! I love German Chocolate Cake. I made one for Thanksgiving, but oh my goodness this sound wonderful!! Thanks for sharing. Oh yum, and since the husband doesn't like coconut I can have the whole thing to myself! Hello. Great blog you have here. Everything looks delicious. I'm from the South too. I can't imagine living in New York. I'm sure we'd stick out too. I've had this one time at a work potluck.... and LOVED it. It looks a whole lot easier than the right side up version. Thanks for posting the recipe. I never did get the recipe from my co-worker and was sorry I didn't. There is a time for apple pie but this time of year calls for decadence - I vote for the chocolate. Gramma knows what she's doing. Yum! Your grandma sure knows how to whip up one heck of a chocolate cake :). Go ahead and give-in like I did, read Twilight :P. You'd be amazed how addicting it is :D.
Heaven help my hips. I can't WAIT to try this. It looks amazing!!! loved the concept of this upside-down version of cake, made of pecans and coconut on the bottom of a frosting-less chocolate cake..wow..nicely done. I read your blog regularly....but I noticed (and I'm only gently teasing) that your last two posts are about things you made and kinda liked but weren't totally sold on. Wow - never seen this type of cake before but it seems wonderful - and relatively simple to make, woo hoo! German Chocolate cake is actually one of my favorites, but this looks even better with that cream cheese! What makes it a German chocolate cake? And this definitely needs some cinnamon. Chocolate LOVES cinnamon! I have made german chocolate upside down cake recipe a number of times and it's absolutely wonderful!